"Lying down in his bed, Sandeep looks out of the window and watches other kids in the neighbourhood play. He keeps on asking me when he would be able to join them and I have nothing definite to tell him. His legs ache so much because of the boils that he can't stand up. But he is hoping to get well soon, I pray to God every day that his wish gets fulfilled." - Priya, Sandeep's mother. 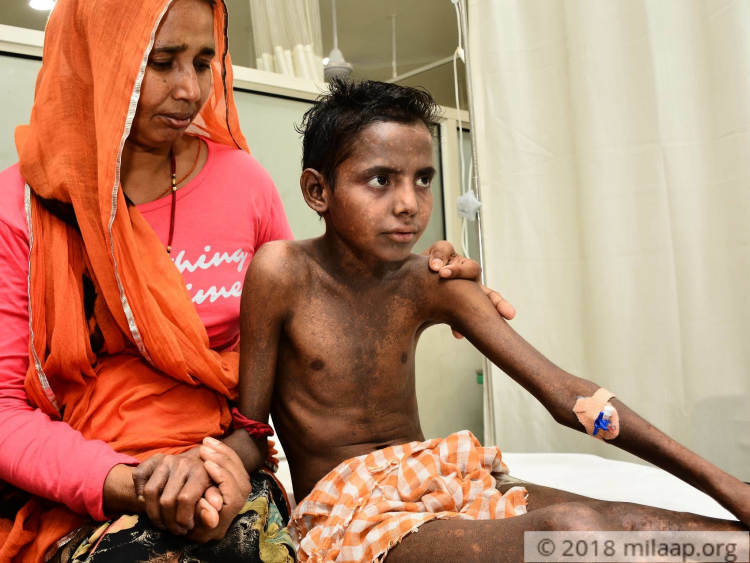 14-year-old Sandeep is in severe pain and his only chance of survival is an urgent bone marrow transplant. The parents feel helpless as they see their son suffering and can't do anything about it. The huge costs of the surgery are a major hindrance. 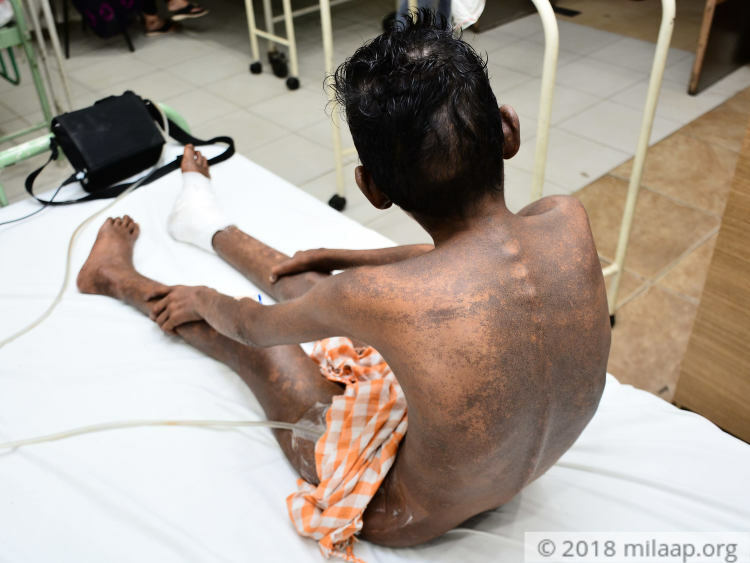 Sandeep has been diagnosed with Dyskeratosis Congenita (DKC) which is an inherited disorder. This ailment is marked with black patches on the skin, abnormal nail growth, and leukoplakia or white patches inside the mouth. 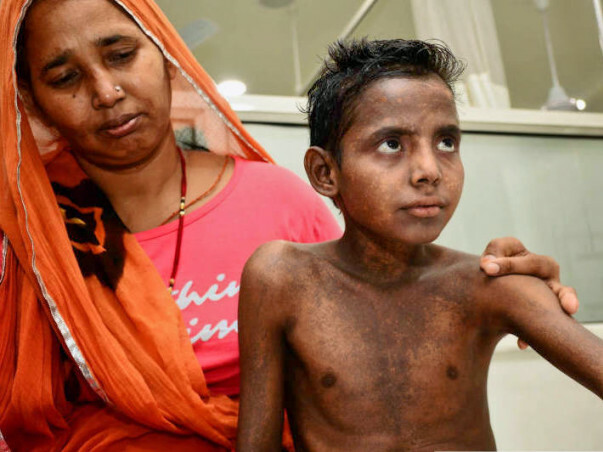 It was only when the black pigmentation on Sandeep’s body started spreading that it caught his parents’ attention. 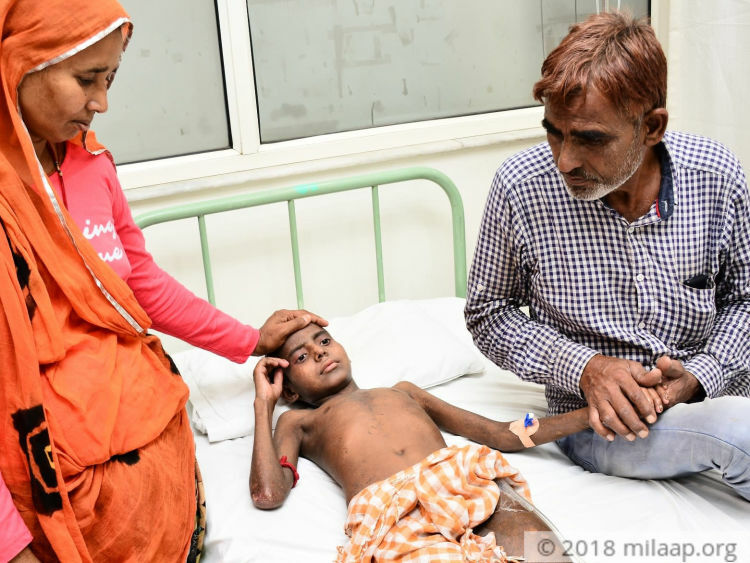 They decided to take him to a doctor and then got to know of the severity of their child’s condition. “I had noticed some boils on his neck, saw him itching them but had not paid much attention to that. He climbs up trees and hides behind bushes while playing, so I thought it must have been some allergy that he has got. Only if I had not been this negligent then,” - Priya. 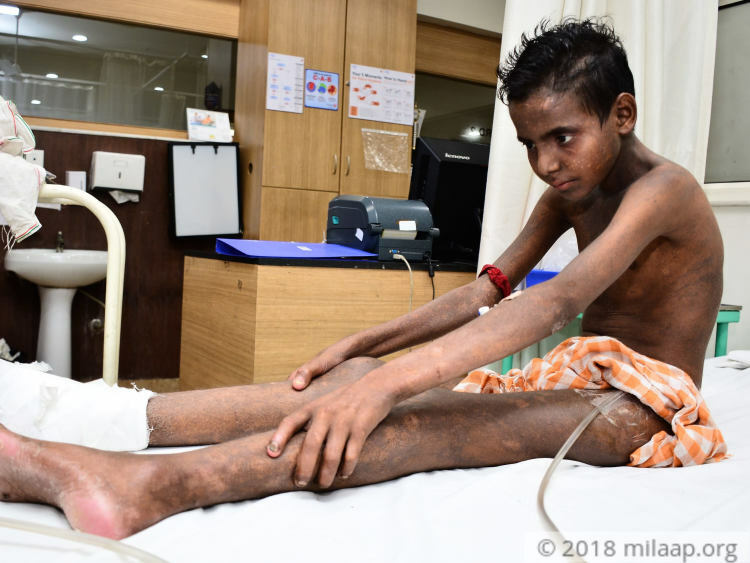 A yellowish-red fluid comes out of the boils on Sandeep’s thighs and legs. He winces in pain and can’t move them at all. He gets injections almost daily. A machine is also attached to his legs that helps in taking out the pus from the boils. “ It’s not just the weakness but also the unbearable pain that doesn’t allow him to get up. His elder brother Rahul and I have to hold him and take him to the washroom, help him to change his clothes. I can see in his face that he doesn’t like this, but he can’t do anything about this,” - Kheralal, Sandeep’s father. Sandeep can't eat anything solid due to the white patches in his mouth. He just has the lentil soup that Priya makes for him. I can see the disease affecting his entire body now, his nails have become distorted, thin and are almost disappearing. Several times I have caught him crying. I often fight with my husband accusing him of doing nothing for Sandeep but I know he is helpless,” - Priya broke down as she said this. Priya and Kheralal both work as farmers. Their monthly income is not adequate for making their two ends meet leave alone a bone marrow transplant surgery. “Sandeep is a bright student, he is in 7th standard. He wants to study further. I am ready to be a donor. My only wish right now is to get him well. But unfortunately, I can’t afford such a huge amount," - Kheralal said. 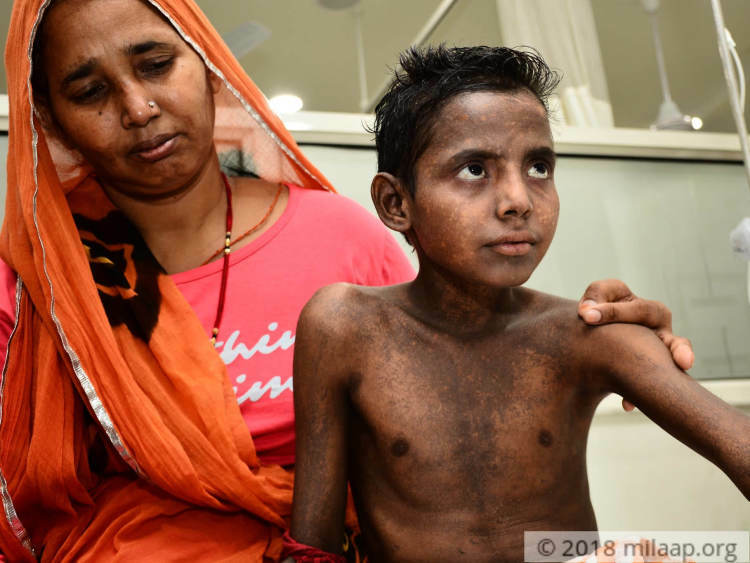 14-year-old Sandeep has been diagnosed with an inherited disorder that has resulted in ugly black pigmentation all over his body. Pus flows out of the boils in his thighs and legs. The little boy who used to love running around with his friends is now bedridden. 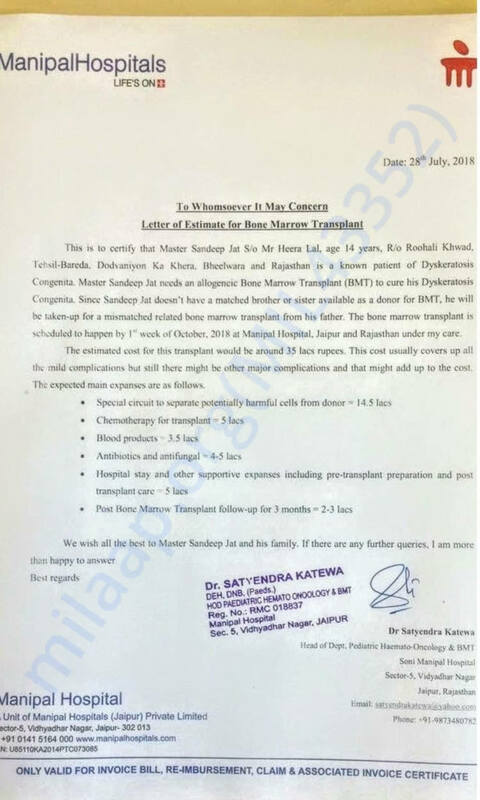 The family is not in a condition to afford this 35 lakhs surgery. 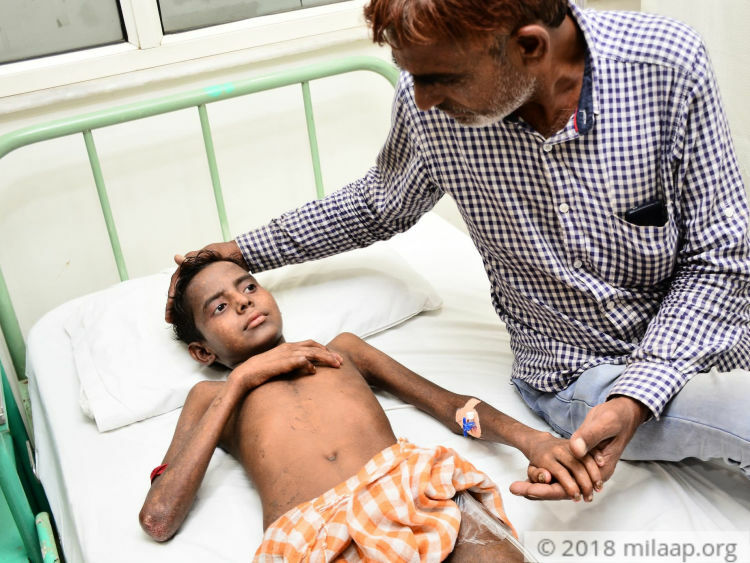 You can help Sandeep get the life-saving surgery and get back to normal life. Sandeep is doing well with the medical management now after the surgery and will not need a transplant for now. Sandeep is doing well. He underwent his hip surgery to control his severe infection. He is stable now and is recovering. Doctors are planning for his Bone Marrow Transplant soon. We shall keep you posted. Thank you for the love and support. Here is an update on Sandeep's health. Sandeep Jat is responding well to the treatment. Doctors are of the opinion that he is now almost fit for the transplant. He had a severe infection in the head of his right thigh bone and to save his life we had to cut that rotten head and right now his right lower limb is in traction machine and we will make him walk after two weeks. Post surgery he is recovering well. To give him cure from this dreaded diseases we are planning his BMT after three weeks but for that we need more help. Please keep sharing this campaign.